"I couldn’t be happier with the Buckfire Law Firm. Everyone was pleasant to talk to and more than willing to help us." Our Michigan personal injury lawyers at Buckfire & Buckfire, P.C. handle cases involving accidents on personal watercrafts (PWC). Commonly referred to as jet skis or ski-doos, these exciting machines make for enjoyable summer afternoons riding around on the lake with family and friends. 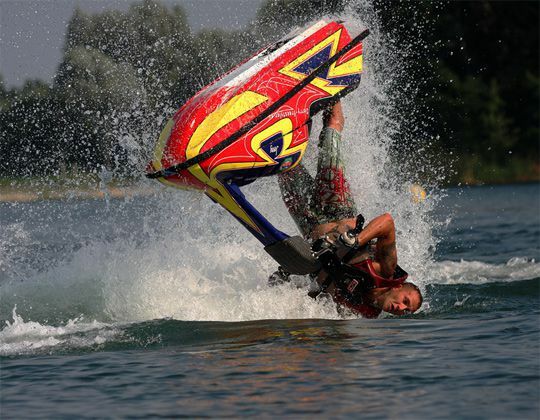 Many times, however, accidents involving jet skis can cause serious injury to the parties involved in the accident. When these unfortunate situations occur, it is important you understand your rights to recover compensation for your injuries. Our legal team has decades of experience handling recreational sporting injuries involving boats and personal watercrafts. A negligent operator of a personal watercreaft, like a jet ski, who is found to be at fault in the accident may be responsible to pay for damages. These can include property, medical bills, lost wages, pain and suffering, and punitive damages. Negligence on a jet ski is subject to the same general rules and regulations as other Michigan boating accidents. Often, these accidents occur due to the negligence of at least one party involved. Accidents can be attributed to a careless or reckless jet ski operator who is lacking basic knowledge of boating safety rules or laws. Other times, alcohol can play a part in these unfortunate situations. Boating under the influence of alcohol can be more dangerous than driving a car while intoxicated, since many people have far less experience operating watercrafts than driving cars. Many of these accidents occur due to alcohol consumption, which can severely impair judgment, reaction time, and the coordination of the operator. The Coast Guard and state agencies should be alerted in the event any of the above criteria is met. Additionally, a boat or personal watercraft insurance company should be contacted. Michigan liability laws for boating accidents can be quite confusing to those who are not familiar, therefore it is important to contact an experienced attorney who has dealt with watercraft accident cases before. The courts will examine the cause of the accident, the degree of carelessness by the operator, and the carelessness of the victim before determining who is at fault in the accident. Our award winning attorneys have handled boating and personal watercraft accidents for decades. We have won large settlements for people just like you who were wrongfully injured in an unfortunate accident on the water. We can do the same for you. Many times, our clients are initially blamed for causing the accident by another party, but after careful investigation by our attorneys and private investigators we are able to prove our client was not responsible for the accident at all. For reasons like these, it is important you have a team of lawyers who specialize in boating accidents to handle your case. Our Michigan jet ski and personal watercraft accident lawyers always represent every client under a strict No Fee Promise. This means that you will not owe a single cent unless we are able to reach a settlement or jury verdict for your case. In the rare event that we are unsuccessful, you will still owe nothing. We promise that we will not be paid until you receive your compensation. If you have suffered injuries as a result of a Michigan jet ski accident, you should contact our award winning attorneys now at (800) 606-1717. We will listen to your story and advise you on what your best course of action will be. If we believe you have a claim for compensation, we will begin working on your case right away. Our team will obtain your medical records, hire private investigators, and file a lawsuit against the party we believe is at fault. All of this, of course, will cost you absolutely nothing. This is our promise to you. Remember, however, that there are strict time deadlines that must be met in order to file a Michigan personal watercraft lawsuit. If those deadlines pass before you speak to an attorney, you case could be lost forever. That is why it is imperative that you contact an attorney as soon as possible to ensure that if you have a case, a lawsuit can be filed on your behalf.